There are no neighbouring blocks of units directly either side and the covered balcony looks out across a sprawling level lawn to uninterrupted views of the golden sands and ocean...Walk from balcony to lawn and over low wall and you are on the beach. Relax on the private balcony or watch your kids playing on the lawn whilst checking out the waves and maybe catching dolphins frolicking in the surf! The apartment has just been renovated. The crisp, white walls contrast with the elegant dark, timber, polished floors to give a modern, contemporary look. The open plan livingdining has an indooroutdoor flow. The induction kitchen features granite benchtops and European integrated appliances. The pristine bathroom has floor to ceiling tiles, frameless glass shower and heated tower rails. There is also internal laundry facilities so you can do your laundry from within the apartment.There is a covered, private individual carport. Plenty of free street parking also. As well as Narrabeen beach and lake, the apartment is well placed for amenities. There are fantastic cafes and restaurants about 200 metres away including The Sands Hotel so an easy walk home at the end of the evening. Infact there are about 16 restaurants within easy walking distance of the apartment! The Surf Club is 50 metres away so there is a safe patrolled surf area close by. You can easily walk to Narrabeen's shops, cafes and restaurants in less than 5 minutes. 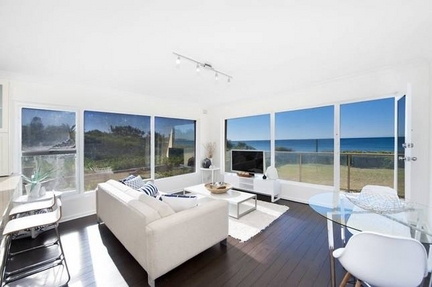 Collaroy is only 15 minutes walk away.